Eimear McBride’s debut novel A GIRL IS A HALF-FORMED THING was published in 2013 to an avalanche of praise: nominated for a host of literary awards, winner of the Bailey’s Women’s Prize for Fiction and the inaugural Goldsmith’s Prize, declared by Vanity Fair to be "One of the most groundbreaking pieces of literature to come from Ireland, or anywhere, in recent years," McBride’s bold, wholly original prose immediately established her as a literary force. Now, she brings her singular voice to an unlikely love story. One night an eighteen-year-old Irish girl, recently arrived in London to attend drama school, meets an older man – a well-regarded actor in his own right. While she is naive and thrilled by life in the big city, he is haunted by more than a few demons, and the clamorous relationship that ensues risks undoing them both. A captivating story of passion and innocence, joy and discovery set against the vibrant atmosphere of 1990s London over the course of a single year, THE LESSER BOHEMIANS glows with the eddies and anxieties of growing up, and the transformative intensity of a powerful new love. Eimear McBride was born in 1976 and grew up in Ireland. She currently lives in Norwich with her family. 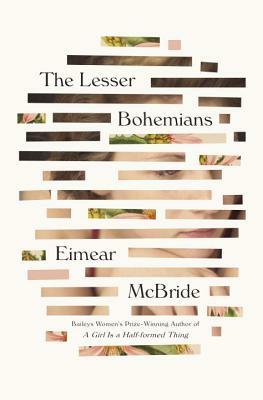 The Lesser Bohemians is her second novel. "[A] propulsive coming-of-age story... imbued with a captivating sense of youthful excitement and vulnerability."